Ghana, officially the Republic of Ghana, is a country in West Africa. It borders Côte d'Ivoire to the west, Burkina Faso to the north, Togo to the east, and the Gulf of Guinea to the south. The word "Ghana" means "Warrior King." It was inhabited in pre-colonial times by a number of ancient kingdoms, including the Ga Adangbes on the eastern coast, inland Ashanti kingdom and various Fante states along the coast and inland. Trade with European states flourished after contact with the Portuguese in the 15th century, and the British established a crown colony, Gold Coast, in 1874. Upon achieving independence from the United Kingdom in 1957, the name Ghana was chosen for the new nation to reflect the ancient Empire of Ghana that once extended throughout much of western Africa. Ghana gained its independence from British colonial rule under the leadership of Kwame Nkrumah, the anti-colonial leader who served as the first president. Army officers dissatisfied with Nkrumah's dictatorial ways deposed him in 1966. Flight Lieutenant Jerry Rawlings, who claimed the presidency in 1981, led the country through a transition to a democratic state that culminated with an historic election in 2000 in which the people rejected Rawlings's handpicked successor by choosing John Agyekum Kufuor as the president. Kufuor was reelected in 2004 for a second four-year term. Ghana is a Republic with a unicameral Parliament dominated by two main parties—the New Patriotic Party and the National Democratic Congress. Over the course of nearly four hundred years, forts along the coastline of today's Ghana provided departure points for millions of West Africans who were loaded onto ships as slaves destined for plantations in the New World. In an exemplary gesture of reconciliation as Ghana prepared to celebrate its fiftieth anniversary of independence in 2007, the nation offered an apology to the descendants of those slaves for the role of black slave catchers in that cruel history, inviting them to reconnect with their ancestors' homeland. Elmina Castle viewed from the sea in 1668. Notice European shipping in foreground and African houses/town shown in left hand corner and in various areas around the fort. The earliest recorded site of probable human habitation within modern Ghana was about 10,000 B.C.E. Pottery dating from the Stone Age (4,000 B.C.E.) was found near the capital city, Accra. Starting in the late thirteenth century, Ghana was inhabited by a number of ancient kingdoms, including an inland kingdom within the Ashanti Confederacy and various Fante states along the coast. Trade with European states flourished after contact with the Portuguese in the fifteenth century. One of the chief exports of the region was human slaves, more than six million of whom were shipped to plantations in the Americas. Millions more died during the overland march from inland areas to the coast, while imprisoned before loading, and on the ships crossing the Atlantic. The west coast of Africa became the principal source of slaves for the New World, overshadowing trading for gold. As other nations moved in to participate in this lucrative trade, the Portuguese were edged out. The British finally gained the dominant position and established a colony, known as Gold Coast, in 1874. Once the United Kingdom granted independence, the name Ghana was chosen for the new nation, a reference to an empire of earlier centuries. This name is mostly symbolic, as the ancient Empire of Ghana was located to the north and west of current-day Ghana. But the descendants of that ancient empire migrated south and east and currently reside in Ghana. After Kwame Nkrumah was overthrown in 1966, a series of coups ended with the ascension to power of Flight Lieutenant Jerry Rawlings in 1981. Rawlings suspended the constitution in 1981 and banned political parties. A new constitution, restoring multiparty politics, was approved in 1992, and Rawlings was elected in free elections (which the opposition boycotted) that year, and in 1996. The constitution prohibited him from running for a third term. President John Agyekum Kufuor was first elected in 2000, defeating the hand-picked successor to Rawlings. He was reelected in 2004 for a four-year term. The 2000 election marked the first peaceful transfer of power in Ghana's history. Ghana is a Republic consisting of a unicameral Parliament and dominated by two main parties—the New Patriotic Party and National Democratic Congress. Well endowed with natural resources, Ghana has twice the per capita output of the poorer countries in West Africa. Even so, Ghana remains heavily dependent on international financial and technical assistance. It receives about one billion United States dollars per year in foreign aid, a figure that accounts for ten percent of its gross domestic product (GDP). As one of the world's poorest countries, it was granted total debt cancellation by the Group of Eight in 2005. In his inauguration speech in 2005, President Kufuor reconfirmed his government's commitment to government accountability, capacity building, agricultural development, and privatization. Although the British have been the traditional main source of external aid, in 2006 China promised about 66 million U.S. dollars to fund development projects as part of its drive to open export markets and secure energy and mineral supplies. Ghana is Africa's second biggest exporter of gold, after South Africa. Timber and cocoa (introduced by the British) are other major sources of foreign exchange. Tourism is also a major source of income. Ghana is considered a transit hub for heroin and cocaine in the illegal drugs trade. The domestic economy continues to revolve around subsistence agriculture, which accounts for 40 percent of GDP and employs 60 percent of the work force, mainly as small landholders. 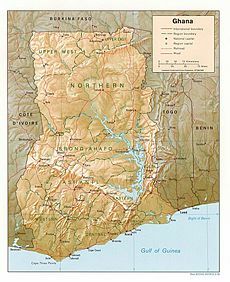 Ghana borders the Ivory Coast to the west, Burkina Faso to the north, Togo to the east, and the Atlantic Ocean to the south. It is located on the Gulf of Guinea, only a few degrees north of the Equator. The coastline is mostly a low, sandy shore backed by plains and scrub and intersected by several rivers and streams. A tropical rain forest belt, broken by heavily forested hills and many streams and rivers, extends northward from the shore. North of this belt, the land is covered by low bush, parklike savanna, and grassy plains. The climate of Ghana is largely the outcome of huge dry continental air masses of the Sahara (the "Harmattan") meeting warm humid maritime air masses from the south. Ghana is divided into two distinct climatic zones by the Kwahu plateau. To the north, there are two distinct seasons—hot dry days with temperatures reaching 88 °F (31 °C) and cool nights in the winter, and warm rainy days in the summer. Rainfall averages between 29 to 39 inches (750 and 1000 mm) annually. 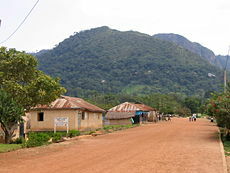 To the south of the Kwahu, there are four distinct seasons with varying amounts of rainfall and generally warm average temperatures from 79 °F to 84 °F (26 °C-29 °C). The rainfall here ranges from 49 to 85 inches (1250 to 2150 mm) annually. Lake Volta, the world's largest artificial lake, extends through large portions of eastern Ghana and is the result of the massive hydroelectric dam completed in 1965 on the Volta River. Ghana is mainly comprised of black Africans which includes almost all Ghanians at 99.8 percent of the population. It is largely a tribal society. The major tribes are; Akan (44 percent), Moshi-Dagomba (16 percent), Ewe (13 percent), and Ga (eight percent). Europeans and others make up the remaining 0.2 percent of the population, which was counted at more than 22 million people in the 2005 census. The major religions are Christianity, practiced by 69 percent of the population; Islam with 16 percent, and indigenous beliefs (such as animism) with 9 percent. English is the official language, however nine different languages—Akan, Dagaare/Wale, Dagbane, Dangme, Ewe, Ga, Gonja, Kasem, and Nzema—all enjoy the status of being government-sponsored languages. 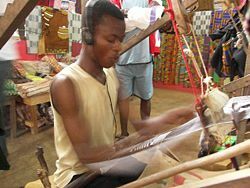 A man weaves kente cloth using a traditional loom in Bonwire (a village) in Ashanti region, Ghana. Perhaps the most visible (and most marketable) cultural contribution from modern Ghana is Kente cloth, which is widely recognized and valued for its colors and symbolism. Kente cloth is made by skilled Ghanaian weavers, and the major weaving centers in and around Kumasi (Bonwire is known as the home of Kente, though areas of Volta Region also lay claim to the title) are full of weavers throwing their shuttles back and forth as they make long strips of Kente. These strips can then be sewn together to form the larger wraps that are worn by some Ghanaians (chiefs especially) and are purchased by tourists in Accra and Kumasi. The colors and patterns of the Kente are carefully chosen by the weaver and the wearer. Each symbol woven into the cloth has a special meaning within Ghanaian culture. Kente is one of the symbols of the Ghanaian chieftains, which remains strong throughout the south and central regions of the country, particularly in the areas populated by members of the culturally and politically dominant Ashanti tribe. The Ashanti's paramount chief, known as the Asantehene, is perhaps the most revered individual in the central part of the country. Like other Ghanaian chiefs, he wears brightly colored Kente, gold bracelets, rings, and amulets, and is always accompanied by numerous attendants carrying ornate umbrellas (which are also a symbol of the chieftain). The most sacred symbol of the Ashanti people is the Golden Stool, a small golden throne in which the spirit of the people is said to reside. It is kept in safekeeping in Kumasi, the cultural capital of the Ashanti people and the seat of the Asantehene's palace. Though the chieftaincy across Ghana has been weakened by allegations of corruption and cooperation with colonial oppression, it remains a vital institution in Ghana. Because of their location, the northern regions of Ghana exhibit cultural ties with other Sahelian countries such as Burkina Faso, Mali, and northern Nigeria. Although those tribes are not indigenous to the area, there is strong Hausa and Mande influence in the culture of the northern Ghanaian peoples. The dominant tribe in this part of Ghana are the Dagomba. Northern Ghanaians are known for their traditional long flowing robes and musical styles that are distinct from those of the southern and central regions. Tuo Zaafi, made from pounded rice, is a specialty from this region that has become a staple across Ghana. The Larabanga mosque in Larabanga is the oldest mosque in the country and one of the oldest in West Africa, dating from the thirteenth century. It is an excellent example of the Sudanese architecture style; other examples include the Djenné Mosque in Mali and the Grand Mosque in Agadez, Niger. After independence, the Ghanaian music scene flourished, particularly the up-tempo, danceable style known as highlife, which is still played consistently at the local clubs and bars, often called spots. Many Ghanaians are adept drummers, and it is not unusual to hear traditional drum ensembles play at social events or performances. Hiplife, another genre of music in Ghana, is now in stiff competition with the more established highlife for airplay on local radio stations and at nightclubs. A movement that started in the mid 1990s, hiplife is a Ghanaian version of hip-hop rap music, with raps basically in the local dialects. Hiplife in present-day Ghana arguably represents youth culture in general. Slowly but surely, hiplife has surpassed "western music" in terms of airplay. The literacy rate is 75 percent. Ghana has 12,630 primary schools, 5,450 junior secondary schools, 503 senior secondary schools, 21 training colleges, 18 technical institutions, two diploma-awarding institutions, and five universities. Most Ghanaians have relatively easy access to primary education, but lack of facilities limits the number who can advance. Education has been a top priority of the government. At the time of independence, Ghana had only one university and a handful of secondary and primary schools. Since the mid-1990s, Ghana's spending on education has been between 28 percent and 40 percent of its annual budget. Primary and middle school education is free and will become mandatory when a sufficient number of teachers and facilities are available to accommodate all students. Teaching is mainly in the English language. ↑ Jackson, John G. Introduction to African Civilizations, 2001. Page 201. ↑ Peter N. Stearns and William Leonard Langer. The Encyclopedia of World History: Ancient, Medieval, and Modern, Chronologically Arranged, 2001. Page 1050. The Parliament of Ghana Official site. National Commission on Culture Official site. US State Department—Ghana Includes Background Notes, Country Study and major reports. This page was last modified on 21 June 2017, at 16:30.